CHOICE® TRIO is a non-AMS liquid water conditioner designed to aid in the performance of herbicides susceptible to negative effects of hard water. CHOICE TRIO performs via three modes of action: sequestering, synthetic chelating and complexing of all hard water cations. 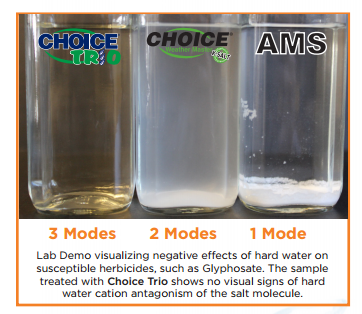 Visual demonstration of negative effects of hard water on herbicides.